Sharks seen swimming near Monmouth Beach on July 19, 2016. With summer 2016 in full swing, many have been on the looking out for tiny stinging jellyfish, dolphins and sharks approaching the shoreline. Earlier this week at Monmouth Beach, a police officer on patrol happened to spot not just one shark, but a group of four of them right from the beach, according to the Asbury Park Press. 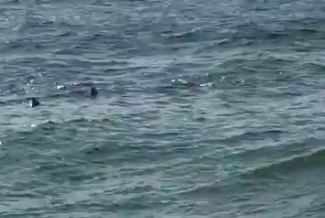 On Tuesday morning, Monmouth Beach Police Lieutenant Daniel McManus responded to the beach after receiving multiple calls about sharks in the water behind a condominium complex at 45 Ocean Avenue. When he arrived, he filmed the sharks about 5 to 10 feet from the shore, each about 3-4 feet long. Based on the sharks' size, Shark Research Institute executive Director Marie Levine said their proximity to the beach is a sign that they were juveniles exploring their surroundings. She couldn't pin down a species, but suggested that they might have been sandbar sharks. Levine said sharks are not naturally inclined to consider humans as a food source and that there remain many misconceptions about the likelihood of attacks. Despite a string of highly publicized shark attacks in 2015, researchers at Stanford University and the Lenfest Ocean Center say attacks have actually been way down over the last six decades. In recent years, the United States has recorded between 30 and 40 annual shark attacks combined on both coasts.